Nestled amid the rolling hills of the Willamette Valley—with that river of the same name running right through it—Eugene, Oregon is the perfect mix of laid-back country style and big-city accoutrements in the form of gourmet restaurants and high-end shopping. Two hours south of Portland, Eugene just happens to also be a dream destination wedding locale: brides can plan wine-tasting trips, a spin down the McKenzie River on a raft, or even a day trip to the rugged Oregon coast. Thanks to the fact that it’s the second largest city in Oregon, everything you need for your Eugene wedding is right here—and below is your guide to the people who can make it happen. Eugene is gorgeous—so why not use the outdoors as a backdrop for your celebration? At Atavista Farms, you’ll have the use of a historic Italianate house, a gazebo surrounded by English Privet hedges and lush photo backdrops (including a beautifully weathered barn). The Beacon House has it all, whether you’re feeling a large lawn wedding, an intimate gazebo ceremony or even indoor nuptials. Centrally located between Eugene and Corvallis, Whisper-n-Oaks is a sprawling outdoor site (with a 900-sqare-foot reception building for the odd rainy day) in a creek-side setting with tons of—you guessed it—oak trees. Within city limits but still country, Country Inn Events Center has two rose garden wedding and reception areas with water features, gazebos and a country clubesque reception area. Out-of-towners love venues that double as an overnight destination, and with such gorgeous options, you’ll love ’em too! Just east of Eugene in Vida lies Eagle Rock Lodge, a rustic, woodsy destination venue snuggled up against the McKenzie River. Between Eugene and Corvallis is Paradise Springs, a grand mountain lodge that boasts an expansive reception hall. But if you’re a city girl, you have a plethora of options from which to choose. Located near the university area is Excelsior Inn and Ristorante Italiano; we love it for its enclosed terrace and garden courtyards. For a large-scale wedding, the Hilton Eugene & Conference Center is a full-service facility, offering the works: a coordinator, banquet services, 30,000 square feet of ballroom with panoramic views of downtown Eugene. The Red Lion can also accommodate a large wedding and is known for its romantic ballroom. Oregon weddings of any size will thrive in the captivating riverside setting at the laidback Valley River Inn, winner of our 2008 “Best Wedding Guest Hotel” in the Valley. Urban elegance is also an option (see, we told you Eugene has everything!). Boulevard Grill boasts two private dining rooms and more than 6,000 square feet of event space. Picturing a chic, artistic affair? 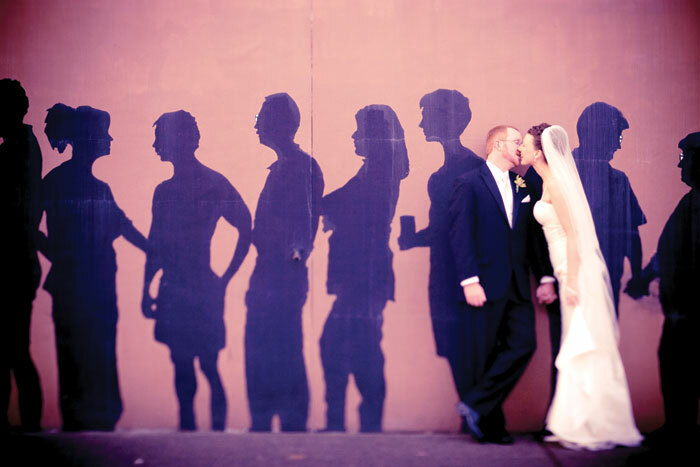 Try the Jordan Schnitzer Museum of Art, for everything from intimate ceremonies in the historic Prince Lucien Campbell Courtyard to larger sit-down dinners. For a vintage feel, try the Downtown Athletic Club, with its natural light and high ceilings. Eugene may be a laid-back town, but they still have love for proper wedding etiquette! The staff at Nick and Nora’s Classic Interiors is well-versed in the ways of Emily Post, and whether yours are Crane’s, Kate Spade or Vera Wang, they’ll make sure your invitation has the correct wording. Flavors Catering & Events offer up all the traditional options: buffet, sit-down, family style, hors d’oeuvres and even food stations. But if you’re dreaming of a Willamette-side garden party, head to Your wedding is all about you—so serve the food you and your fiancé love! Get local with a Cravings Fine Foods “Bountiful Pacific Northwest Wedding Buffet.” Unsure of what kind of meal to serve? The “wedding artists” at Brindiamo Catering & Events Center have a mobile kitchen with state-of-the-art equipment—which means restaurant-quality food in any locale. Many pastry chefs here emphasize using local, natural ingredients when possible, so you can actually offer your guests a taste of Eugene! Sweet Life Patisserie has a space just for brides called Bliss Wedding Arts Salon, where you’ll discover delectable, all-natural cakes almost too stunning to cut into. Want to go green? The Divine Cupcake offers delicious cupcakes that are always organic and vegan—and yummy! Bottom line: Music sets the mood for your event—especially when it comes to getting your groove on. With more than 300,000 songs to choose from, Eclectic Edge Events helps brides and grooms create a song list in advance, while the staff at All Pro DJs offer what they call “Elegant Event Design,” a way for you to pre-plan the music, timeline and event lighting design for the ceremony, first dance and beyond. Mix your vows into your first dance song with Bass is Loaded!’s “Your First Dance…Forever!” package or choose “Synergy Media,” where music is set to pictures of your day—and then played at your reception. Eugene is a haven for outside-the-box thinkers—which lends itself especially well to floral design. At Passionflower Design, the staff ’s expertise as botanists, gardeners and florists lead to exceptionally imaginative creations (think Brussels sprouts). Renee Rocker of City Mouse Designs uses nature as inspiration, which translates into an earthy, fun, artistic style. For a fashion-forward look, independent designer Shannon Kilduff of Sun Blossoms Floral provides unique, trendy pieces on any budget. For a wide selection and variety combined with more than 20 years of experience, visit Shamrock Flowers & Gifts. Portland’s not the only place that sells looks for the whole party! For your dress, look no further than Bellamissa owner Bess Nobel: She can whip up your ideal look, whether you're looking for custom design or a couture replica. Freudian Slip carries an extensive selection of beautiful lingerie including strapless bustiers, stockings, chemises, Spanx and even crystal-adorned "Mrs." Hanky Panky thongs! Grooms need only visit Mr. Formal. The store carries more than 70 tuxedo styles by top designers like Calvin Klein. And let's not forget your mom! She'll be pleased to know that Portland's Joy's Uptown Style just opened a second location in Eugene, featuring occasion wear and accessories for women. With such beautiful surroundings, photographers flock to Eugene, so your only problem is finding the perfect one! Oregon's most award-winning photographer, Bruce Berg, is a genius with lighting and artistic composition. All you need to know about Richard May? He's been named Oregon's Wedding Photographer of the Year by various organizations multiple times. James McCormick and Trask Bedortha, the photographers at Studio Coburg, share a passion for artful photojournalism using a mixture of modern and vintage lenses to create a wonderful mix of images. Richard Roman is a former L.A. fashion photographer who will get high-style images for your big day! Looking for videography? Vivid Wedding Films offers brides something fresh with Super 8 Film and a progressive, cinematic style-and with same-day editing, you'll have your video quicker than you can say "Action!" Eugene's not exactly a walkable town, so you'll have to plan for transportation. Dove Express adds that touch of class with an old-school two-passenger Excalibur or a unique four-passenger Excalibur limousine. At Abed's Limousine, rent a towncar or Hummer or stretch limo for your big day, or treat your guests to a Tailored Wine Tour. Whether it's a hippie-chic wedding or a high-profile event, weddings are an art-and in Eugene, event planners are a whimsical bunch. Shelle Weddings & Events focuses on creativity, working with each couple to draw out individual styles. For a modern, detail-oriented approach, try the girls at I Do Wedding & Event Coordination—we love that they're a pair of sisters with their mother. For full-service wedding coordination with unlimited rentables, try Parties to Go Events & Productions; they have Eugene's largest selection of linens, tables, flatware and tents. The one person who makes it official shouldn’t be an afterthought in your planning process.